Celebrate fall with this recipe from Le Cordon Bleu Chefs. The dish marries the sweet notes of butternut squash with the contrasting earthy flavor of golden chanterelles. It's simple to make, and brings a cheerful touch of warmth to November. Place the flour, olive oil and eggs in a bowl fitted with a knife blade of a food processor. Process until mixture begins to form large crumbs. Transfer to a lightly floured work surface and knead for 2 minutes to obtain a smooth, even consistency. Wrap in plastic film and refrigerate for 20 minutes. Cut butternut into 1 cm dice. Sweat in a pan over a low heat with half the butter, covered with a lid. Once soft, about 10 minutes, remove about 50 g of the cooked butternut and reserve for garnish. Crush the remaining 300 g butternut with a fork. Wash and dry golden chanterelle mushrooms, pan fry in the remaining butter until soft, about 5 minutes. Allow to cool, roughly chop half the mushrooms and combine with the crushed butternut and season. Reserve the remaining whole golden chanterelle mushrooms for the garnish. Roughly cut the butternut into small pieces and place in a pan with the milk. Bring to a simmer and cook until soft, about 10 minutes. Grate the parmesan and add to the mixture, blend using a hand blender until smooth and frothy. Season and keep warm. Roll out the dough until it is 2 mm thick using a pasta machine. Cut out disks approximately 6 cm diameter. Put a small amount of the butternut and golden chanterelle mushroom filling in the centre of each disk. Brush edge of pasta with beaten egg, and fold over to make a half moon shape. Take the pointed end of each shape and squeeze together to form the ring shaped tortellini. Finely chop half of the sage leaves and set aside. Shallow fry the remaining sage leaves whole in the olive oil until crisp, about 2 minutes. Drain on kitchen paper and season with salt. Melt the butter in a pan over a low heat and reheat the reserved golden chanterelles and diced butternut. Add the capers and chopped sage leaves to warm through. Bring a pan of salted water to the boil and cook the tortellini for 3 minutes. 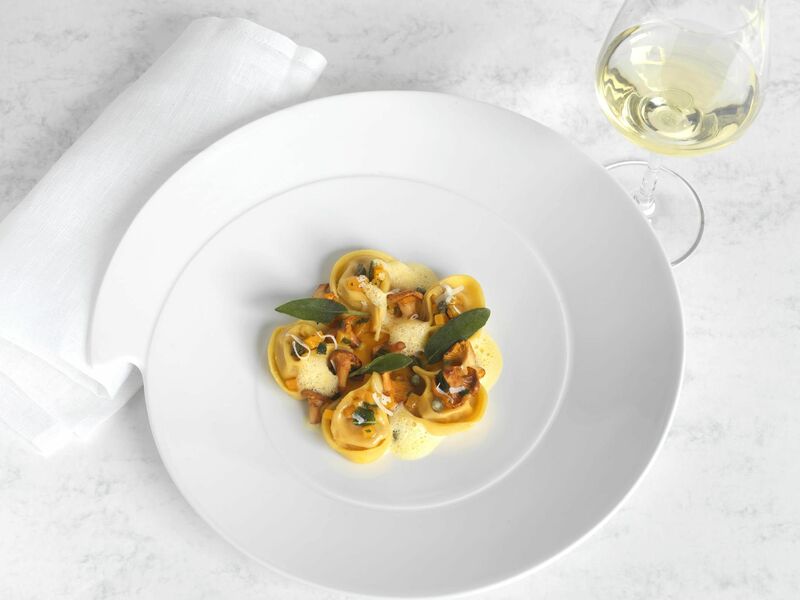 Arrange 5 tortellini on each plate, 25 with the golden chanterelle mushrooms, butternut, sage and caper mixture. Spoon over the butternut and Parmesan cream and finish with grated parmesan and fried sage leaves. Lovely autumnal colours for an autumnal treat! Why not pair the earthiness of the mushroom with a ripe and mature white wine. The Saint Joseph Blanc Domaine du Monteillet from Stephane Montez 2011, a typical northern Rhône blend of Marsanne and Roussane would fit the bill perfectly. It is nutty, honeyed, concentrated and brimming with dried apricot flavors. This wine still possesses enough freshness to offset richness of the tortellini and will not be overwhelmed by the Parmesan, sage and capers. A wine of this level of complexity of aromas deserves to be served slightly warmer than the majority of whites. It might therefore be worth taking it from the refrigerator 15 minutes before serving and not keeping it over ice. If you don’t have the luck of finding this wine, a 4 years old Rhône or Languedoc barrel fermented wine will do just fine. Happy pairing!